Watch BC Law Students Argue at the Ninth Circuit Court of Appeals! 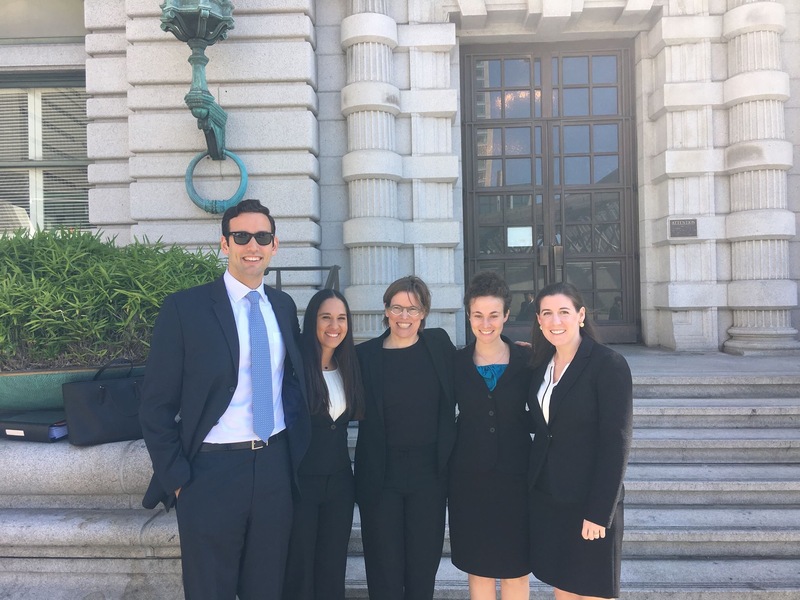 As part of BC Law’s Center for Experiential Learning Ninth Circuit Appellate Program, four of our third-year law students prepared briefs and argued today in front of the 9th Circuit Court of Appeals on behalf of indigent clients. In the Ninth Circuit Appellate Program, supervised law students prepare briefs and argue immigration cases brought by indigent clients who would otherwise be without counsel. The Ninth Circuit Court of Appeals, headquartered in San Francisco and hearing cases arising from Alaska, Hawaii, Washington, Oregon, California, Montana, Idaho, Nevada, and Arizona, screens pro se cases and selects those that present important issues that deserve further development. Past cases have included asylum, withholding, Convention Against Torture claims, questions relating to immigration consequences of criminal convictions, and issues of statutory interpretation that present questions of first impression to the Court. The Court schedules the opening brief to be filed in October, the reply brief in January, and oral argument before a panel of sitting judges in April of the same academic year. Students travel to the court hearing to present oral argument. The Court then issues its decision based on the merits of the individual cases. Students develop and apply numerous skills, including client communication, legal research, brief writing, and oral advocacy. Jovalin Dedaj (’16), Cristina Manzano (’16), Mary Pat Brogan (’16), and Shayna Sehayik (’16) cumulated their year-long clinic by presenting oral argument to three Ninth Circuit judges. The students were tremendous and dazzled in their presentation. They had worked hard all year and displayed a command and mastery of the material. It looks like we have a chance of winning case one. And on the second, although we will likely lose the asylum claim, it looks possible that we may win on a criminal issue that might help others. In appellate advocacy, when representing indigent clients, we are facing uphill odds. Our success is not measured by wins and losses but by how well we fought and how well we prepare our client for the outcome of the decision. Our students were exemplary in learning the value of hard work and tremendous preparation. I could not be prouder of their efforts. From left to right: Jovalin Dedaj (’16), Cristina Manzano (’16), Professor Kari Hong, Shayna Sehayik (’16), and Mary Part Brogan (’16). The student attorneys stood before Judge John T. Noonan, Judge Carlos Bea, and Judge Morgan Christen. Judges Bea & Christen echoed Professor Hong’s praise for the student attorneys. The students were prepared through rigorous moot sessions in which some of the best practitioners in this field participated. We were fortunate to have Dan Kanstroom, Mary Holper, Sharon Beckman, Cathy Kaveny, Karen Breda, Aimee Mayer-Salins, Beth Zilberman, Katie Horigan, Yara Kass-Gerji, Casey Riley, and Caryn Sigurdson from the BC community participate. Boston-based practitioners Dan Kasselbrenner, Wendy Wayne, Susan Church, Kathleen Gillespie, Phil Torrey, Carlos Estrada, Leah Litman, Adriana Lafaille, and Sarah Sherman-Stokes provided invaluable insights that helped us forge the arguments. And recent BC alumni Xing-Yin Ni (’15) and NCAP alumni Shannon Johnson (’15), Jeremy Sanders (’15), and Kelly Schwartz (’15) returned to help. Mackenzie Houck (’14) and Alejandra Salinas (’15) met up with the team in San Francisco. The students could not have succeeded without the time and expertise these people offered. Updated at 12:16 PM on Tuesday, April 26.